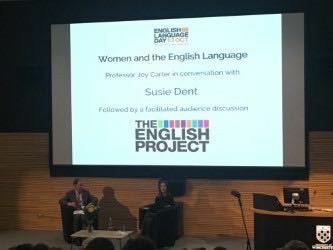 Our A-level English Language Students were fortunate to attend an event hosted by The English Project at Winchester University this week. Susie Dent of “Countdown” and “8 out of 10 cats does Countdown” fame was in conversation with Professor Joy Carter of Winchester University about “Women and Language”. It was fascinating to hear Ms Dent to discuss the origins of well-known phrases such as “lick into shape” and the sexism inherent in lexis used to describe men and women. Whilst successive waves of feminism have caused the removal of obvious examples of casual sexism, leading to the use of gender neutral pronouns or both “his/her” being used more frequently, there is still much work to do, Ms Dent opined, before the negative connotations and collocations of words associated with women lessen. The event passed far too quickly with members of our own party keen to question Ms Dent about topics such as her opinion in accents in English but time constraints meant the session drew to a close. An incredibly useful and interesting evening; we were grateful to Mr McNulty who got us there and back in the minibus!